Wire terminals and connectors generally have a rating in amps. This is crucial information for choosing the right terminal, as a mismatch between amps in wire and terminal can ruin a repair, damage the vehicle it's been made in, and in some cases even put your customers and employees in severe danger from fires and electrocution. So, look at the rating closely; your customers and your team will thank you. There are plenty of ways a company can hype up their product, ranging from labeling a common design with a fancy marketing-department approved name to making claims about its efficiency that matter less to you than the price. The problem is that sometimes amid all that jargon is actually useful information. So flip past the marketing and look at the technical specifications. 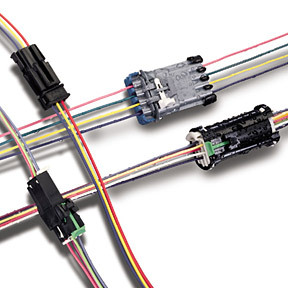 It can be fairly easy to assume that aside from brand names and housing colors, all connectors and terminals are the same. But that can be a trap for purchasing departments; sure, they may do the same job, but they might not be built to the same quality standards, and it's a hard-learned lesson for many of us that flash and sizzle tend to drive up the price, not the build quality. So once you know what type you need, look carefully at your distribution options; you might be pleasantly surprised by what turns up. If there's a disconnect between purchasing and the shop they're supplying, there's going to be a problem quickly. True, you don't need to talk brand names or the nuances of purchasing, but nobody knows the components you use better than the guys who use them, every day. Often the shop team has valuable feedback about which connectors and terminals work best and which they'd rather not use, the information you won't be able to get out of a catalog. Sometimes you'll need to compromise -- especially if you need to switch brands to find a better price or find more efficiency -- but make sure they're in the loop, so you don't find yourself becoming the returns department. Too often, when buying wire terminals and connectors, people leave the supply chain out of the equation. That can be an enormous mistake, and not just because a good distributor can find you deals on any connector you're considering. A good distributor will know what connectors you use and why, and will be able to guide you towards suitable alternatives if a part suddenly becomes unavailable or you need a rush order of something that's low on stock. Especially if you find yourself in need to turn around an order of a specific part quickly, having a good distributor in your corner is crucial. If you need the best automotive electrical components, take a look at our terminals and connectors. We'll find you the best parts, at the best price, every time.